Just eight minutes into the direct flight to Kuala Lumpur, MH132's pilot queried why his Airbus A330 was heading so far south. It is understood passengers on board the flight, which left at 2:23 am Christmas Day, were not alerted to the mix-up. During discussions with air traffic controllers at the Auckland Oceanic control center, the pilot was informed of the flight plan his airline had given to Airways, which manages air traffic control for New Zealand and South Pacific. He then continued across the Tasman Sea before heading northwest to Kuala Lumpur. Although there were no apparent safety concerns with the confusion, Airways yesterday confirmed it was investigating. "We have an internal safety team who will investigate it," a spokeswoman said. "The flight plan the airline filed with us was going to Kuala Lumpur but via a slightly different route than the pilot was expecting." Airways will "work closely" with the much-maligned carrier to find out how the confusion came about, the spokeswoman said. Last year, 577 crew and passengers lost their lives on two separate Malaysia Airlines flights. Flight MH370 disappeared between Kuala Lumpur and Beijing for unknown reasons in March and MH17 was shot down by a Russian-made missile over Ukraine in July. The airline did not respond to requests for comment. New Zealand aviation commentator Peter Clark praised the pilot for his actions. "The pilot has done a very good job by noticing it, querying it and not just blindly flying off and ending up in the Southern Ocean," he said. He said if Malaysia Airlines was now a responsible airline, "which I hope it is after everything that has happened", it would ask for an explanation and investigate. Flights on the route often travel around the bottom of Australia to avoid bad weather or head-winds, Clark said. "The pilot was probably not used to going that far south." WeatherWatch head analyst Philip Duncan said he flew out of Auckland this week in "perfect conditions". A large high was settling across the Tasman Sea. The weather between New Zealand and Kuala Lumpur was "fairly calm", but Duncan said thunderstorms across northern Australia and Papua New Guinea may have influenced Malaysia Airlines' preferred route. Allegiant Airlines Flight 806 with scheduled service from St. Pete-Clearwater International Airport (PIE) to Springfield-Branson National Airport (SGF) departed at 1:45 p.m. local time. Shortly thereafter, the aircraft returned to PIE due to a maintenance issue. Out of an abundance of caution, an emergency was declared and the plane landed safely. Maintenance crews are now inspecting the aircraft to determine the cause. The aircraft was carrying 133 passengers and six crew members. "The safety of our passengers and team members is always our utmost priority. We apologize to our passengers for the inconvenience and are offering them $150 dollars off vouchers. Passengers may also choose to change their reservations to any other flight in our system at no additional fee. Those who choose not to travel will receive a full refund." Passengers continued on to SGF on a replacement aircraft, departing PIE at 5:10 p.m. local time and arriving at SGF at 6:38 p.m. local time. PINELLAS COUNTY, Fla - Allegiant Airlines flight returns to St. Pete-Clearwater International Airport due to mechanical issue. Flight 806 to Springfield-Branson National Airport took off at 1:45 pm from Clearwater. Shortly after takeoff the aircraft returned to the airport due to a mechanical issue. An emergency was declared and the plane landed safely back at the airport. 133 passengers and six crew members were on the flight. Allegiant says that they are working to get passengers on the way to Springfield-Branson Airport as quickly as possible. Could flights from Ogdensburg fly to hubs in New York City, Philadelphia or Chicago? OGDENSBURG – With 150-seat Allegiant jets expected to begin regular service to major Florida tourist destinations late next year, can flights to major hubs in New York City, Philadelphia or Chicago be far behind? Airports in Bangor, Maine and Great Falls, Mont., provide some insight into what might be possible in St. Lawrence County. Both offer nine or 10 daily flights on 50- to 100-passenger jets to several major cities as well as service by Allegiant Air. And both airports are located in counties two to three hours away from another major airport and have similar populations and geographic size as St. Lawrence County. The Ogdensburg Bridge and Port Authority is planning to spend $47,000 to market its expanded airport to airlines that might provide more passenger and freight service. So far, they say it is too premature to predict how successful they will be. But St. Lawrence County – with 111,944 people spread over 2,821 square miles, and a two- to three-hour drive from airports in Syracuse and Burlington, Vt. -- shares many similarities with the greater Bangor and Great Falls areas. Bangor International Airport provides at least nine daily flights to Philadelphia and Washington D.C. by American Airlines and to LaGuardia in New York City and Detroit by Delta. Great Falls International Airport offers ten daily Delta, United and Alaska Air flights to Minneapolis, Salt Lake City, Denver and Seattle. Bangor is 128 miles or nearly two hours away from the nearest airport in Portland, Maine, according to Google estimates. Bangor, population 32,673, is located in Penobscot County, population 153,923. But Penobscot County covers 3,557 square miles, 26 percent more than St. Lawrence County’s 2,821 square miles. Adding 26 percent to St. Lawrence County’s population – to account for residents in Malone, Brockville, Ont. and eastern Jefferson County where residents might consider Ogdensburg as a departure destination -- brings our total population to more than 160,000. And while St. Lawrence County’s largest community, the Town of Potsdam, is barely more than half the size of Bangor – 17,029 – the population of Potsdam, Massena, Ogdensburg, Canton and Gouverneur combined is 58,999, nearly double the number in Bangor. After Bangor, the next-largest community in Penobscot County is Brewer, population 9,482, smaller than St. Lawrence County’s four largest municipalities. Great Falls, with a population of 59,315, is roughly equal to the size of St. Lawrence County’s five major communities combined. But it is located in Cascade County -- at 2,711 square miles very similar in size to St. Lawrence County -- but with only 82,384 people in the entire region. Great Falls is 165 miles or two hours, 42 minutes to the Missoula, Mont. airport and 185 miles or two hours, 50 minutes to the airport in Bozeman, Mont., according to Google. By contrast, Ogdensburg is 128 miles or two hours 6 minutes from Syracuse and 171 miles or three hours, 28 minutes to the airport in Burlington. Massena is 163 miles or two hours, 46 minutes to Syracuse and 136 miles or two hours 49 minutes to Burlington. For St. Lawrence County, the wild card could be the effect of the nearby location of the Ottawa, Ont., international airport, located just 55 miles and one hour six minutes from Ogdensburg. Currently some St. Lawrence County residents drive to Ottawa instead of Syracuse or Burlington because it is at least one hour closer. But those travelers also face several hurdles – a passport is required to cross the border and earlier-than-normal arrival times at the are sometimes necessary airport because flights to the U.S. are treated as international flights. And while the exchange rate currently favors U.S. travelers leaving from Canada, that situation could change over time. 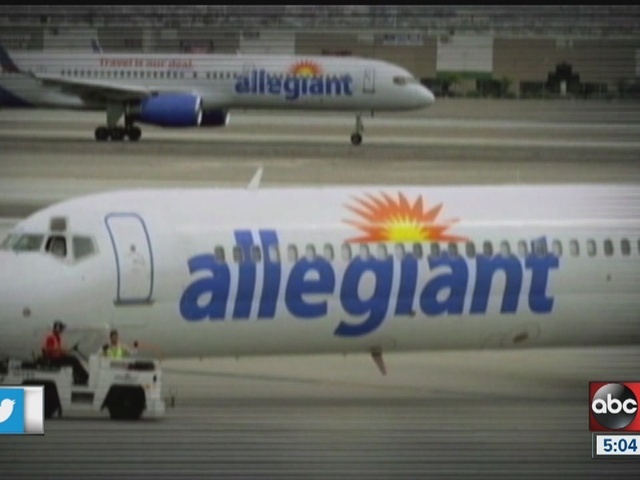 Despite those issues, Allegiant is expected to draw some of its passengers from Canada. Not only would an Ogdensburg departure provide convenience for some, it will also offer direct service to Florida in about half the time as other airlines that require a change of planes and a layover at a major metropolitan airport. Nearby Watertown is a similar distance from Ogdensburg as Ottawa – and only 66 miles and one hour 6 minutes north of Syracuse’s Hancock International Airport. Still, Watertown leaders recently lured American Airlines to provide daily service that now departs for Philadelphia. For most of the year, 50-seat jets are used, but in the winter, 37-seat De Havilland Dash 8 Turboprops make the flights due to runway limitations. Watertown is the population hub for Jefferson and Lewis counties with a combined population of 146,149. It is also home to Fort Drum that presumably creates a higher-than-normal demand for air travel due to soldiers traveling home when on leave. A further lure for Ogdensburg could by the $2.4 million in annual federal Essential Air Service funding that currently subsidizes three daily round-trip Cape Air flights to Albany on nine-seat airplanes. Massena receives $2.6 million for similar service. In Watertown, $3.4 million in EAS funds previously used for Cape Air flights now subsidizes the daily service to Philadelphia instead. Both Bangor and Great Falls do not receive EAS funding, according to the U.S. Department of Transportation. TUCSON- Today our nation's president traverses the world in Air Force One, a flying fortress, equipped with the most advanced technology available. Just over six decades ago, a designated aircraft for the leader of the free world, didn't even exist. That is, until our 34th President narrowly missed a disaster in the sky. Prior to the election of Dwight D. Eisenhower, U.S. President's flew on Air Force planes used to fly V.I.P. 's around. There didn't appear to be a need for an Air Force One, until there was a near miss over the skies of New York. In 1953, President Eisenhower was on board an Air Force, Lockheed C-121 Super Constellation called the Columbine, heading in for a landing in New York City. Brad Holliday, Dynamic Aviation Project Manager, said, by chance, another aircraft with the same flight number happened to be landing at the same time. "For a period of time air traffic control was not aware it was dealing with two aircraft." Back then, military V.I.P. aircraft were identified by it's serial number. The Columbine's was 8610, the same flight number as an approaching Eastern Airlines commercial flight. "The confusion was resolved before any accident took place," said Holliday. "But it was classed as a near miss and after that incident the Air Force and the White House worked on a unique call sign which became Air Force One." The Columbine, the country's first Air Force One, would serve President Eisenhower through 1954, before being replaced by a newer aircraft. It remained in the presidents fleet, flying various dignitaries around the globe before it was retired in 1968. 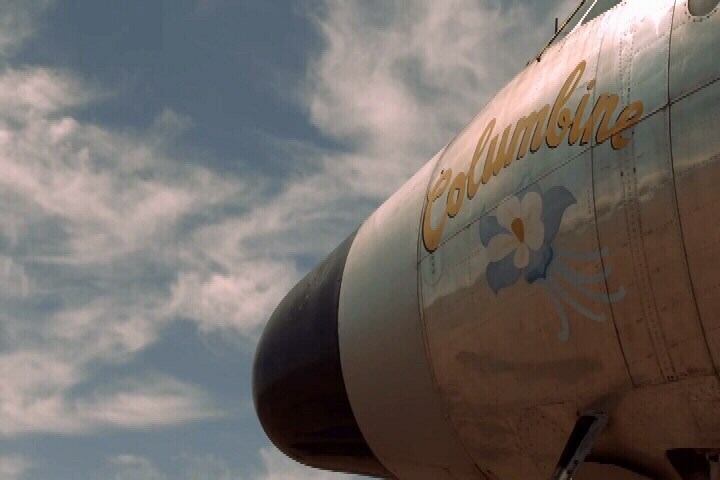 More than 40 years later, after being used for parts and almost scrapped, Dynamic Aviation is on a mission to restore the Columbine back to it's original glory. Brad Holliday said the plan is to completely restore the interior of the plane exactly as it once was and to return the Columbine to it's original flying condition, turning the very first Air Force One into a flying museum. "The intent is to have it fully functional, fully operational, fly to air shows and other presentation events so that the public can see it," said Holliday. "The only Air Force One aircraft that is not in a museum." There are currently two Air Force One's. The Boeing 747-200B's have now been in service for 25 years. They are supposed to be replaced by new aircraft sometime after 2023 at an estimated cost of $3 billion. The pilot and passenger departed on a local flight in the amateur-built experimental airplane using an intersection departure from the runway. Several frames of a surveillance video that captured the airplane during the initial climb from the runway showed a thin white trail of vapor/smoke behind the airplane. GPS data recovered from the airplane indicated that the airplane climbed to about 100 ft above ground level, leveled off, turned left at the end of the runway, and entered a descent. Shortly thereafter, the airplane collided with parked vehicles about 0.25 miles from the departure end of runway. Examination of the accident site indicated that the airplane impacted in a near-vertical attitude, consistent with an aerodynamic stall. During examination of the wreckage, no evidence of airframe malfunction or failure was detected. The propeller displayed no evidence of rotational damage, consistent with a loss of engine power before impact. The engine's turbocharger would not rotate, and the turbocharger compressor housing displayed impact marks made by the compressor wheel, indicating that there was little relative motion between the blades and the housing at the time of the impact. The turbocharger's wastegate system was tested on an exemplar engine, and no anomalies were noted. It could not be determined whether the turbocharger would not rotate due to impact damage or whether it seized in flight resulting in a partial loss of engine power. Engine test runs with a turbocharger in a seized condition could not be conducted. The mixture control lever was found near the idle-cutoff position with a corresponding witness/impact mark around the circumference of the control stem, indicating that the lever was in the cutoff position at the time of impact. It could not be determined at what point during the flight the lever was moved to the cutoff position. Attempts to produce white smoke from the engine by leaning the mixture to the cutoff position and by inducing a loss of engine power due to water contamination were unsuccessful. The exemplar engine's failure to produce white smoke when the mixture was leaned suggests that the loss of engine power was not the result of the pilot moving the mixture control lever to the cutoff position during takeoff. It is possible that the pilot moved the lever to the cutoff position after the airplane departed from controlled flight. The reason for the loss of engine power could not be determined. The circumstances of the accident are consistent with the pilot failing to maintain sufficient airspeed following a loss of engine power during takeoff, resulting in the airplane's wing exceeding its critical angle-of-attack and a subsequent aerodynamic stall. Instead of using the full runway length of 6,179 ft, the pilot elected an intersection takeoff with about 2,570 ft of available runway. Calculations showed that, had the pilot used the entire runway for takeoff, sufficient runway for a landing following the loss of engine power would likely have been available. The pilot's failure to maintain sufficient airspeed following a loss of engine power during initial takeoff climb, which resulted in the airplane's wing exceeding its critical angle-of-attack and a subsequent aerodynamic stall. The reason for the loss of engine power could not be determined because examination of the wreckage revealed no mechanical deficiencies. Contributing to the accident was the pilot's decision to conduct an intersection takeoff. On June 2, 2015, about 1520 central daylight time, a Sonex SA amateur-built airplane, N123SX, impacted unoccupied, parked military vehicles at a manufacturing facility shortly after departing the Wittman Regional Airport (OSH), Oshkosh, Wisconsin. The private pilot and pilot rated passenger were fatally injured, and the airplane was substantially damaged. 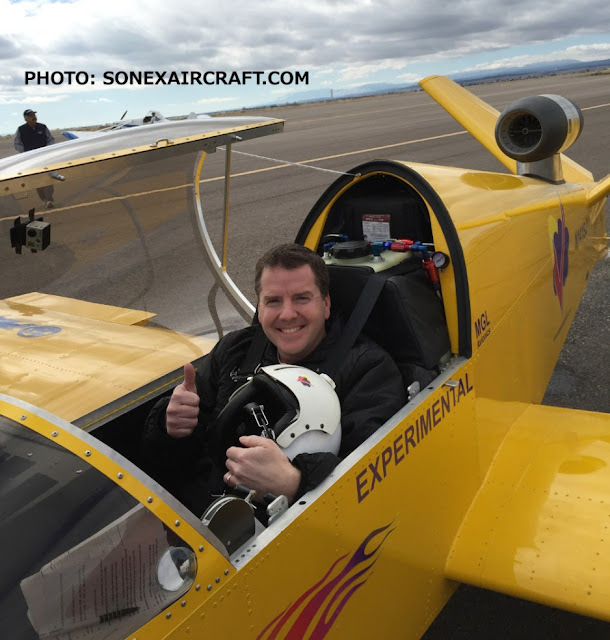 The airplane was registered to and operated by Sonex Aircraft LLC, under the provisions of 14 Code of Federal Regulations Part 91 as a personal flight. Visual meteorological conditions prevailed for the flight which operated without a flight plan. The local flight was originating at the time of the accident. According to OSH air traffic control tower personnel, the airplane departed runway 9 from the intersection of runway 9 and runway 13. After clearing the airplane for takeoff, the tower controller focused his/her attention on inbound traffic and did not witness the accident. A surveillance video from Oshkosh Defense manufacturing facility captured a portion of the accident flight. The video captured the airplane during its initial climb from the runway. In several of the frames, a wisp of white appears to briefly emanate from the airplane. The pilot, age 40, held a private pilot certificate with ratings for airplane single engine land, airplane single engine sea, and gliders. He was issued a third class medical certificate on February 22, 2013, without any limitations. As of March 15, 2015, the pilot had accrued 715 hours of total time. He was estimated to have at least 540 hours in Sonex type airplanes and 25 hours in the AeroVee Turbo airplane. The Sonex SA was a low-wing, tailwheel, 2 seat airplane built in 2007, serial number 0008. It was powered by a 100 horsepower AeroVee Turbo engine driving a wood composite, fixed pitch, Sensenich propeller. On June 20, 2007, it was issued a special experimental/amateur-built airworthiness certificate. The original AeroVee engine was removed and the company's prototype AeroVee Turbo was installed on May 8, 2014, which returned the airplane back to Federal Aviation Administration (FAA) Phase 1 test flight period, at a tachometer time of 96.52 hours. Phase 1 was completed on September 23, 2014, at a tachometer time of 118.2 hours. The last recorded maintenance on the airplane was a modification to the cockpit avionics, on January 12, 2015, at a tachometer time of 126.8. Following that maintenance, the airplane was flown cross-country to Florida, and returned back to Oshkosh, Wisconsin, on April 28, 2015. A company mechanic recalled flying with the accident pilot for no more than 1 hour in the days preceding the accident flight and stated the flight was uneventful. The airplane was last fueled on April 28, 2015, at the De Kalb Taylor Municipal Airport and flown about 125 nautical miles to Oshkosh, Wisconsin. At 1537, an automated weather reporting facility located at the Wittman Regional Airport, reported wind from 130° at 11 knots, visibility 10 miles, a clear sky, temperature 72° F, dew point 39° F, and an altimeter setting of 30.10 inches. The Wittman Regional Airport is a public airport with a control tower, and it is serviced by 4 runways aligned with 18/36, 9/27, 5/23, and 13/31. The airplane departed from runway 9, which is a 6,179 foot long, grooved concrete reported to be in good condition. The pilot elected to do an intersection takeoff from the intersection of runway 9 and 13, with about 2,570 feet of available runway for the takeoff. The accident site was located about a ¼ mile east-northeast of the departure end of runway 9. The airplane came to rest on a general heading of 220 degrees on unoccupied parked military vehicles located on Oshkosh Defense property. All components of the airplane were found in the immediate vicinity of the accident site. The engine separated from the airplane and was located on the ground in front of the airplane. All major components remained attached to the airplane. The airplane was transported to a secure facility for further examination. Both wings displayed impact damage. The leading edge of the left wing was twisted rearward. The left flap remained attached to the left wing. The left aileron remained attached to the aileron push/pull rod. The outboard portion of the left aileron as well as the outboard portion of the left wing outboard of the aileron control rod section was torn and separated. The leading edge of the right wing displayed rearward accordion crushing. The right aileron and flap remained attached to the wing. The empennage was distorted and wrinkled near the aft cockpit and relatively undamaged near the rudder. The horizontal stabilizers, vertical stabilizer, and rudder were not damaged. Both elevators were buckled at their inboard sides. Flight control continuity was established from the ailerons to a section under the cockpit control stick. In addition, elevator continuity was established from the elevators to the same section under the cockpit control stick. This area was crushed and distorted resulting in an inability to smoothly move the cockpit controls. Continuity to the rudder was established to the rudder pedals. The flaps appeared to be in the retracted position. The flap selector bracket was deformed and flap handle was bent away from the bracket. Both throttles (left and right seat positions) were in the full forward position. The mixture control was near the idle-cutoff position with a corresponding witness/impact mark around the circumference of the control stem. The elevator trim was near the full nose down position, which, according to the company, was an area normal for takeoff in this airplane. No preimpact anomalies were detected with the airframe. The propeller remained attached to the engine. Both tips of the wooden propeller were fractured in an aft direction. There were gouges on the nose cone of the propeller. No rotation scoring was detected on the propeller nose cone or the propeller blades. The AeroInjector carburetor was impact separated from the engine, but remained connected to the airframe via the throttle and mixture cables. The intake housing to the turbocharger was impact separated. The cylinder rocker box over the No. 3 and 4 cylinders was also impact separated. There was some rearward distortion to the No. 3 and 4 valve rocker arms and rod housings. Engine continuity was confirmed through the engine to the flywheel. In addition, valve train continuity was established. Seven of the 8 spark plugs were removed and examined. None of the spark plugs appeared excessively gapped and were not fouled. The top No. 1 spark plug was bound tightly, so it was not removed during the examination to prevent any damage to the plug or housing. Oil was detected throughout the engine. All four cylinders were borescoped and found to have normal wear and deposits on the cylinder bores, pistons, and valves. The AeroInjector's throttle slide operated smoothly and normally, and its needle valve was installed in the proper orientation. The needle valve was unobstructed and channeled fuel when fuel was added to the AeroInjector's fuel inlet. The engine's turbocharger could not be rotated by hand. Disassembly of the turbo found static marks corresponding to compressor blades without any smearing or deformation of the blades. Disassembly of the turbo found that the bearing housing was cracked. 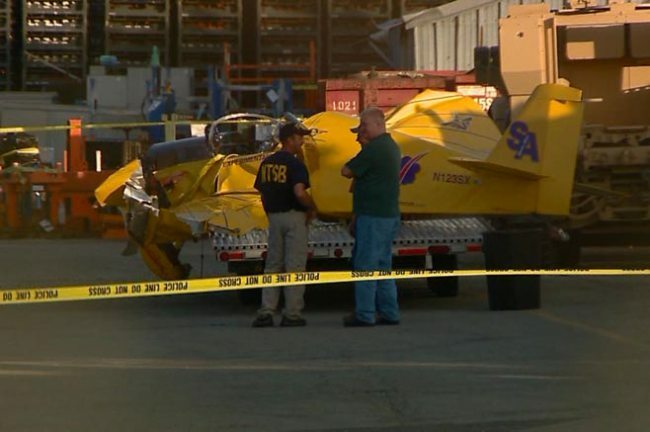 Disassembly was halted after finding a crack in the housing and the component was shipped to the NTSB materials laboratory in Washington D.C. for further examination. The airplane was equipped with a MGL Avionics iEFIS Lite electronic flight instrument system. The unit's micro SD card and portions of the iEFIS were shipped to the NTSB vehicle recorders laboratory for data download. An autopsy was performed on the pilot by the Fond du Lac County Medical Examiner as authorized by the Winnebago County Coroner's Office. The cause of death was multiple traumatic injuries. The FAA Civil Aerospace Medical Institute performed forensic toxicology on specimens from the pilot. Testing was negative for carbon monoxide and ethanol. Ibuprofen was detected in cavity blood. Ibuprofen is a non-narcotic analgesic and anti-inflammatory agent. The turbocharger was sent to the NTSB materials laboratory for examination. Sonex did not provide turbocharger manufacturer information regarding the components of the turbocharger assembly, but did provide an exemplar assembly for comparison with the accident assembly. No manufacturer identification marks were present of the exemplar turbine or compressor housings. The manufacturer name and serial number for the exemplar wastegate actuator were present on the left face of the exemplar wastegate actuator housing. However, the left face of the accident wastegate actuator housing had an unpainted machined surface, and both the manufacturer and serial number were missing. Impact marks were located at the upper and aft portions of the compressor housing surface. The impact marks were relatively distinct and discrete consistent with little relative motion between the blades and the housing at the time of impact. Corresponding blade damage was observed on the compressor wheel. Six of the compressor blades had radial cracks that emanated inward from the outer edges. The cracks were all associated with deformation of the blade where the airfoils between the cracks and the blade tip were bent toward the pressure face of the blade (toward the direction of rotation). Both the compressor wheel and turbine wheel turned together freely within the center housing when either wheel was rotated by hand. The flange for attaching the center housing to the compressor housing was fractured around the circumference. The fracture surface was uniform and rough consistent with overstress fracture. The location of the fracture was consistent with the compressor housing moving to the right relative to the center housing. While differences were noted between the accident and exemplar wastegate actuator in terms of spring coil diameter and number of coils, the displacement response was very close between the two actuators. The accident wastegate actuator was shipped to Sonex for further testing on a test cell engine. The accident engine was impact damaged and could not be used to conduct testing. The accident wastegate actuator was installed on a test bed engine. Under the auspices of the NTSB and FAA, the engine was started and run to maximum power. The wastegate opened when manifold pressure exceeded 43 inches and maintained manifold pressure between 40 to 43 inches. Engine RPMs varied but were generally about 3,100. The wastegate actuator was then opened and the engine functionally tested. The engine produced about 2,500 RPM and manifold pressure was between 28 to 29 inches. The actuator was returned to normal operation and the engine functionally tested. Attempts to replicate a production of white smoke from the engine were attempted utilizing the full range of mixture level motion and speeds and included forcing a loss of engine power due to water intrusion. The attempts to replicate the production of white smoke using the test engine were unsuccessful. Of note, actual engine performance with a turbocharger in a seized condition could not be conducted. A company employee reported he experienced a degraded turbocharger system a few weeks prior to the engine functional test. During that flight, the airplane would fly level, but could not maintain a positive climb. He reported that after the flight, the turbo was examined and found to not be completely seized, but the piston ring-type seal on the shaft connecting the compressor and turbine wheels had partially seized and interfered with the shaft's ability to rotate. An examination of the accident turbocharger did not find a similar signature. Replicating a seized turbocharger during engine operation was not possible. The accident engine was disassembled and no preimpact anomalies were detected with the engine. The micro SD card did not contain any flight performance data for the accident flight, or any flights prior to the accident. Only GPS coordinate and altitude information could be retrieved directly from the iEFIS. However, this data did not include time information, so airplane performance could not be evaluated. Of the data available, the recording began near the intersection of runways 9 and 13. The airplane departed near taxiway alpha and climbed to about 100 feet above ground level. It then leveled off and turned left over railroad tracks at the end of the runway and began a descent, at which point the recording ended. The accident airplane's ground run was about 1,700 feet before the airplane took off from the runway. The airplane climbed straight ahead for about 2,150 feet before beginning a left turn. The distance traveled during the left turn to the accident site was approximately 583 feet. A departure from runway 9 and taxiway B1 would have provided about 5,695 feet of runway available. On June 2, 2015, about 1520 central daylight time, a Monnett Sonex SA experimental amateur-built airplane, N123SX, impacted unoccupied vehicles, after departing the Wittman Regional Airport (OSH), Oshkosh, Wisconsin. Both private pilots were fatally injured. The airplane was substantially damaged. The airplane was registered to and operated by Sonex Aircraft LLC, under the provisions of 14 Code of Federal Regulations Part 91 as a personal flight. Visual meteorological conditions prevailed for the flight which operated without a flight plan. The local flight was originating at the time of the accident. According to OSH tower personnel, the airplane departed runway 9 from the intersection of runway 9 and runway 13. After clearing the airplane for takeoff, the tower controller focused their attention on inbound traffic and did not witness the accident. The accident site was located 0.25 miles east-northeast of the departure end of runway 9. The airplane came to rest on unoccupied vehicles located on Oshkosh Corporation's property on a general heading of 220 degrees. The engine separated from the airplane and was located on the ground in front of the airplane. All major components remained attached to the airplane. The airplane was transported to a secure facility for further examination. 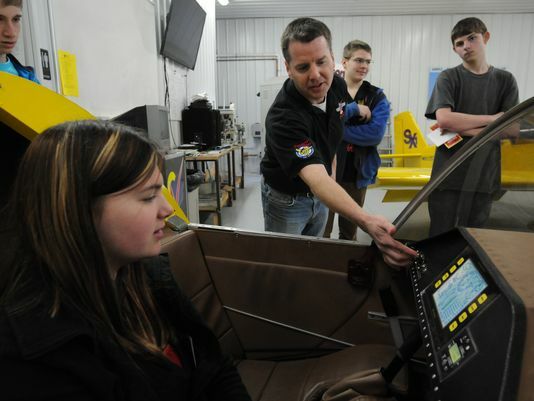 Jeremy Monnett, of Sonex Aircraft shows Kiera Heisler of Perry Tipler Middle school what it is like inside the cockpit of one of their planes as part of a job shadow experience for 8th graders put on by the Oshkosh Chamber of Commerce in this 2014 file photo. When covering breaking news and public safety, reporters often find themselves writing about the worst day of somebody’s life. This certainly was the case on the afternoon of June 2, when a single-engine Sonex Sport Acro crashed about 3:20 p.m. at Oshkosh Corp.’s north plant, near Wittman Regional Airport. Neither of the plane’s occupants survived. It wasn’t until the next day the Oshkosh-based aircraft kit manufacturer announced its CEO Jeremy Monnett and assembly mechanic Mike Clark were killed in the crash. Monnett had come in on his day off to take Clark, a relatively new employee, up for a local recreational flight to let Clark become more familiar with the aircraft. About a week before the crash, Monnett, 40, spoke to the Oshkosh Common Council in favor of creating an aviation business park that he said would attract more businesses and, in turn, jobs to the region. His passion for the industry and for his community were his calling card, those who knew him said. 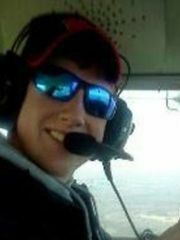 Clark, 20, had just graduated from Fox Valley Technical College with a technical diploma in airframe and powerplant mechanics and was scheduled to take his FAA certification test within a couple of weeks. While nobody enjoys having to report on a fatal crash, it is a necessary evil of the news industry. Talking to those who are left behind often can provide a sense of closure but also allows a deeper understanding of the individual. Journalism is about storytelling, and everyone has a story. It’s a reporter’s job to tell it. 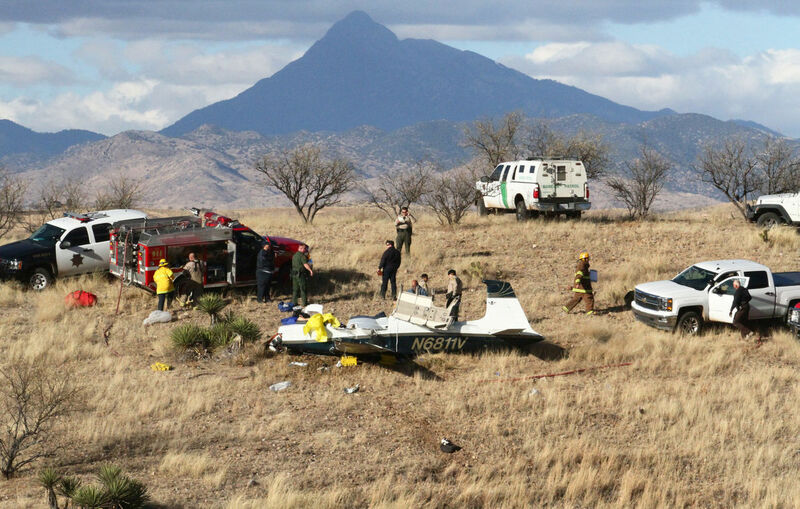 On December 26, 2015, about 1340 mountain standard time, an Aerostar Aircraft Corporation of Texas, M20F airplane, N6811V, impacted hilly terrain about 10 miles from the Nogales International Airport (OLS), Nogales, Arizona. The private pilot/owner operated the airplane under 14 Code of Federal Regulations Part 91 as a personal cross-country flight. The student pilot, and two passengers received serious injuries. The airplane sustained structural damage. Visual meteorological conditions prevailed for the flight, and no flight plan had been filed. According to responding law enforcement, the airplane collided with a hillside before coming to rest upright a short distance from the first identified point of impact (FIPI). One of the landing gear had separated and came to rest near the FIPI, and the engine separated from the firewall, but remained in its relative normal position at the front of the airplane. Reported weather from OLS at 1354 was wind from 320 degrees at 11 knots, gusting to 26 knots; clear skies; 10 statute miles visibility; temperature 06 degrees Celsius; dew point -13 degrees Celsius; altimeter setting 29.86 inches of mercury. The pilot of a small plane that crashed Saturday afternoon near the Nogales International Airport is in critical condition at a Tucson hospital, but one expert says his efforts to land the struggling aircraft on a hillside in rugged terrain amid windy conditions may have saved him and his three passengers from instant death. The pilot, 57-year-old Mitsuo Tamayama, was the most seriously hurt in the crash. Two passengers were in stable condition and another was listed as critical but stable, Sheriff Antonio Estrada said Monday. All were airlifted to Banner University Medical Center after being extracted from the plane. Tiffin, who was at the hospital Sunday, said the victims suffered spinal injuries and lacerations. “They were all hurt pretty bad,” he said. Investigators from the Federal Aviation Administration (FAA) arrived at the scene Sunday and removed the wreckage. Estrada said one of the investigators told his office that the plane, a single-engine, four-seat 1971 Aerostar M20F, was 300 pounds overweight, which caused the crash. Tiffin was less certain that excessive weight was the culprit. “It could have been, but maybe not. It’s a powerful airplane,” he said, adding that mechanical failure will need to be considered as well. “The investigation will find out what caused it, but at this point I think (the pilot) did proper things to minimize the impact,” he said. The FAA’s initial investigation could be finished in as soon as a week, though the National Transportation Safety Board’s final report may not be finished for months, Tiffin said. The initial 911 call reporting the crash came in from the airport at 1:47 p.m. Saturday, said Sheriff’s Lt. Raoul Rodriguez. Tiffin said he was at home at the time, but one of his staffers witnessed the aircraft struggling after takeoff. “The plane was having some trouble climbing,” he said, noting that the wind was strong that day and had led to the cancellation of most training flights. Tiffin, who has more than 40 years of experience as a pilot, runs a flight school at the airport. The witness saw the pilot try to turn away from the most dangerous terrain. “I think it was the action of the pilot that got them to a place where they could land,” Tiffin said. 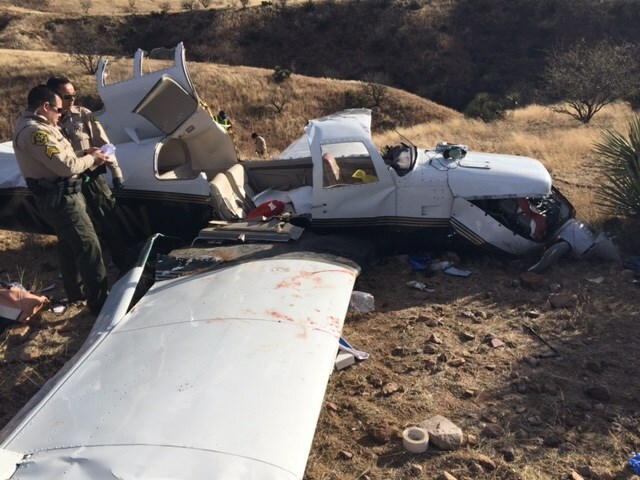 As the plane approached the grassy hillside where it eventually came to rest, its wheels caught the edge of a canyon, which ripped the landing gear off. The plane then slid approximately 40 feet on its belly before stopping. “It was probably going 70 to 80 miles per hour at that point, and to stop in 40 feet – that’s why they got hurt,” Tiffin said. A pilot at the airport took flight to pinpoint the location of the crash, and Tiffin was escorted to the scene by a member of the Patagonia Marshal’s Office. They were the first to arrive at the spot, approximately a half-mile from the northeast end of the runway near Forest Service Road 235. They found the pilot and four passengers trapped inside, bloodied and in urgent need of extraction. “If it had caught fire, they wouldn’t have got out,” Tiffin said. A law enforcement officer arrived and he and Tiffin used a tire iron to try to free them from the cabin. “It took us dang near 15 minutes to get the door open,” he said, adding that by that time, emergency responders were at the scene. A crew from the Nogales Suburban Fire District reportedly used the jaws of life to extract the victims. The aircraft was leaking fuel and fire crews pulled hoses as a precaution, the Rio Rico Fire District said in a news release. Tubac Fire District personnel were also on scene to evacuate the victims, and the U.S. Border Patrol, Patagonia Marshal's Office and Sheriff’s Office provided assistance as well. Tiffin noted that the last fatal accident at the airport was in 1994 and involved a plane that went down in similar conditions at a spot within 200 yards of Saturday’s crash. The Sheriff’s Office identified one of the passengers as 67-year-old Takako Fujisawa and another as a Brazilian-Japanese student pilot named Thiago Fugumoto, whose age was not immediately available. The fourth passenger, whose name was not made available to the Sheriff’s Office, was reportedly the wife of Tamayama, the pilot. “Obviously, it’s very fortunate that not all four of them were killed,” Estrada said. A search of the plane's tail number N6811V on the website NNumber.org listed it as being registered in Fairfield, Calif., and Tiffin said the group was on its way to California at the time of the crash. Tamayama was identified in the story as being a resident of Fairfield, Calif.
NOGALES- The pilot of a small plane that crashed in Nogales this weekend is in critical condition at a Tucson hospital. According to the Santa Cruz County Sheriff's Office, 57-year-old Mitsuo Tamayama suffered the worst injuries out of the three other passengers. Two are currently in stable condition and one is in critical condition but is expected to survive. The small plane crashed near the Nogales International Airport around 1:30 p.m. Saturday. FAA investigator's initial report reveals that the plane was over its weight limit. The plane was not built to carry four people and their luggage. When it took off, it was unable to gain altitude and crashed. The plane has now been taken to Phoenix where it can be further examined. 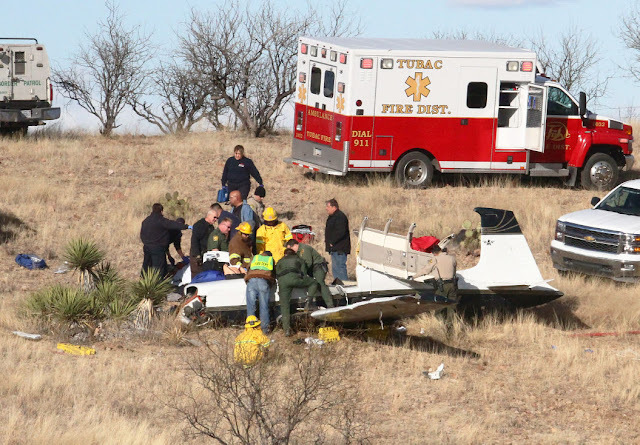 NOGALES, AZ (Tucson News Now) - According to Santa Cruz County Sheriff, Tony Estrada, the FAA Investigator looking into the cause of the plane crash near Nogales says the preliminary cause of the crash is that the plane was over its weight restrictions. Estrada says there were too many passengers and luggage on board the plane which was not manufactured to handle the weight. Sheriff Estrada says the pilot, 57-year-old Mitsuo Tamayama is in critical condition. Another passenger is in critical condition and the other two are listed as stable. The student pilot is from Japan. All four victims are being treated at the Banner UMC Trauma ICU in Tucson. First responders rushed to Nogales International Airport after the plane had trouble during takeoff Saturday afternoon. Sheriff Estrada says the small plane landed hard shortly after takeoff. 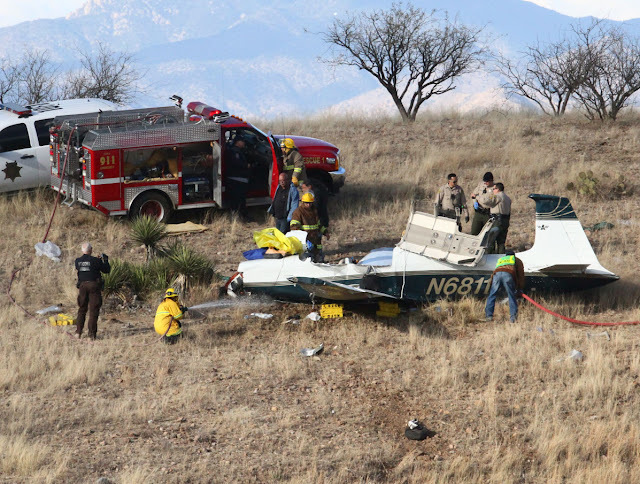 The pilot suffered the most injuries to his head, according to Estrada. 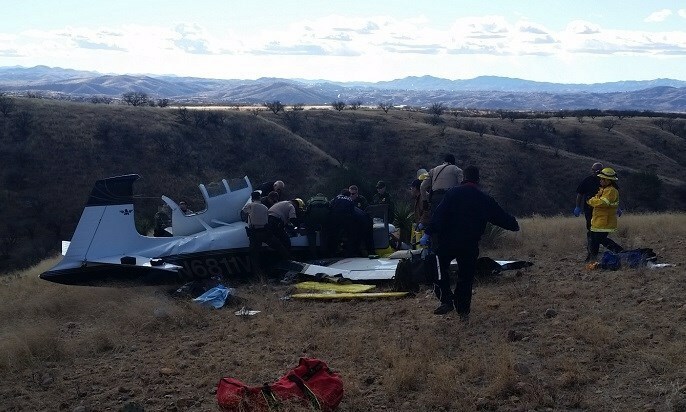 The plane was headed to California when something went wrong, and it grazed the top of a hillside on the way down. Those on board were airlifted to Banner UMC. 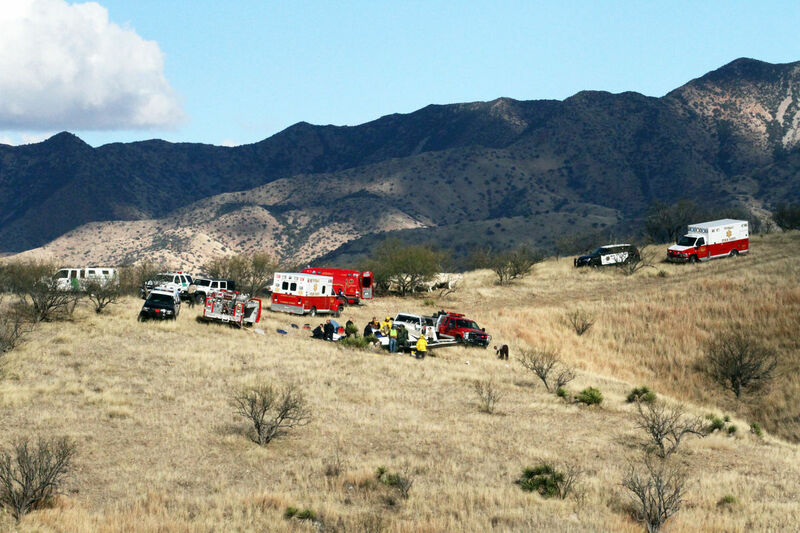 First responders from Nogales Suburban Fire District, Rio Rico Medical & Fire District, Tubac Fire District, Patagonia Marshal’s Office, Santa Cruz County Sheriff’s Office and the US Border Patrol all responded to the crash. Four people were flown to a Tucson hospital Saturday afternoon after the small plane they were traveling in crashed near the Nogales International Airport. Lt. Raoul Rodriguez of the Santa Cruz County Sheriff’s Office said the initial 911 call came in from the airport at 1:47 p.m.
An eyewitness said the plane appeared to be having trouble as it took off. The crash site was approximately a half-mile from the northeast end of the runway. There were no obvious sign of fire or explosion at the scene. None of the four passengers was critically injured and all were conscious when rescuers arrived, though some suffered head injuries, Rodriguez said. The roof of the plane had to be cut off to extract them. The victims were subsequently airlifted to Banner-University Medical Center in Tucson. Rodriguez identified the pilot as Mitsuo Tamayama, 57, of Nogales, and one of the passengers as Takako Fujisawa, 67, of Patagonia. He did not have the names of the other two. The cause of the crash was also not immediately known. Representatives from the National Transportation Safety Board are scheduled to arrive at the scene Sunday, Rodriguez said. 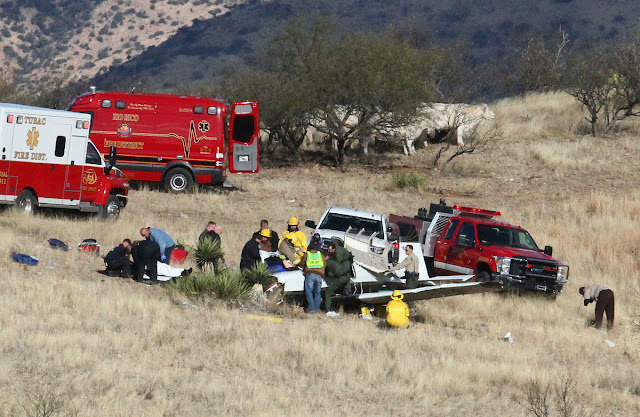 Personnel from the Sheriff's Office, U.S. Border Patrol, Patagonia Marshal's Office and Tubac, Rio Rico and Nogales Suburban fire districts were seen at the crash site Saturday. First responders rushed to Nogales International Airport after a plane had trouble during takeoff Saturday afternoon. A small plane landed hard shortly after takeoff, according to Santa Cruz County Sheriff Tony Estrada. Four people, three male and one female, were on board, according to Fire Chief Carlos Parra Jr., with Nogales Suburban Fire District. He said four helicopters were requested for all four passengers, who were strapped in and needed to be pulled out. The pilot, a 57-year-old man, suffered the most injuries to his head, according to Estrada. He said the the pilot, a 57-year-old woman, a student pilot and an unknown fourth person were on their way home to California. Parra said he learned that the plane left Nogales International Airport and lost altitude because of engine problems. He said the plane grazed the top of a hillside on the way down. The four patients were hurt badly, but expected to survive, according to Parra. He said they were airlifted to Banner UMC. As of 7 p.m. Saturday, all four were still in the hospital, according to Estrada. He said the Federal Aviation Administration will not be investigating the crash. 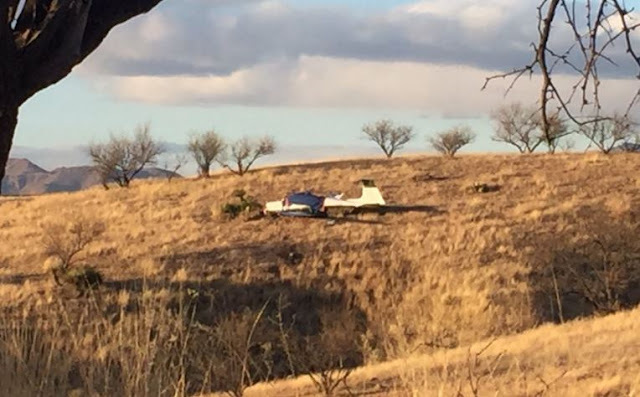 NOGALES, Ariz. (KGUN9-TV) - A small plane with four passengers crashed when it was taking off from Nogales airport, according to Santa Cruz County Sheriff. Sheriff Antonio Estrada said they got the call about the crash just after 1:30 p.m.
Estrada said all four people are okay and have minor injuries.